*Continental U.S.; some restrictions apply. UPS times guaranteed except during the holidays; Standard times estimated. Orders over 2 lbs. or $150 go via UPS for $6.95. Orders $250 & up sent signature required. Business days are Monday through Friday - excludes weekends and holidays. See Holiday Schedule below for more information. The map above shows the normal time-in-transit for UPS ground shipments made from our facility in Livermore, CA, in the San Francisco Bay Area, to physical street addresses in the U.S. (non-P.O. Box addresses.) UPS does not deliver to P.O. boxes. We do not ship to UPS stores or similar types of locations. Fast, low cost flat rate ground shipping is just $6.95 regardless of order size. UPS: $6.95 over #2 ($10.95 under #2) - guaranteed arrival in 1-6 business days once shipped - delivered by UPS to your street address. Only $6.95 for shipments over 2 pounds or $150. Standard: $6.95 - estimated arrival may take up to 3 weeks once shipped - final delivery by the post office to mail address. Would you like to get free email or text alerts for all UPS packages coming to your home? Delivery alerts, delivery planner, approximate delivery time, sign for packages online, add delivery instructions, pick up packages at your convenience, fee based address delivery changes $5.00 per package, fee based deliveries on another day $5.00 per use, fee based upgrade SurePost deliveries to UPS Ground $3.50 per package, confirmed delivery window. Above delivery dates do not apply to orders shipping via the USPS (P.O. Boxes, standard to AK & HI) or to Canadian addresses. UPS requires a physical street address for deliveries. Standard requires a mailing address for deliveries (final delivery is by the post office). *Standard and USPS delivery times are estimated; packages will arrive at your regional postal center with a few days but make take up to 3 weeks for the final delivery to your home by your local post office. *Only Next Day Air and 2 Day Air delivery dates are guaranteed if picked up or delivered between December 11th and December 24th. See the UPS Delivery Map to determine your shipping region. Not available for all locations. Weight limits apply. Will not be listed as an option if not available. Standard: $6.95 - Usually arrives with 9 business days but may take up to 3 weeks once shipped although delivery times are not guaranteed - final delivery by the post office to mail address. UPS Ground is guaranteed (except pickups and deliveries during the holiday period from December 11th through December 24th). 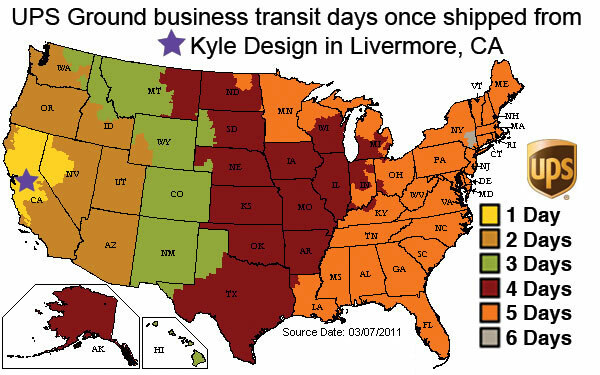 Delivery transit times depend on distance from our warehouse in CA. In general, the San Francisco Bay Area takes 1 day, West Coast 2 days, Northwest and Mountain areas take 3 days, Midwest takes 4 days and East Coast takes 5 days. Please see the UPS Transit Time Map to check your particular location for expected time. UPS 3 Day is guaranteed and takes 3 business transit days after shipping. So if you place an order late Tuesday and it ships on Wednesday, it will be delivered on Monday (the 3rd business day). Note exception on December 21 - will take 4 business days because of holiday rush. UPS 1 Day is guaranteed and takes 1 business transit days after shipping. So if you place an order late Thursday and it ships on Friday, it will be delivered on Monday (the 1st business day). Standard & USPS times not guaranteed and deliveries are dependent on volume, so during heavy shipping periods delivery times will be longer. Standard & USPS have Saturday delivery, UPS only offers this for a special fee. Please contact us if you wish to upgrade your service to have your order delivered on a Saturday. We attempt to provide same day order processing on Next Day Air, 2nd Day Air, and 3 Day Air orders placed before 3:00 pm. ET but cannot guarantee it. To confirm same day shipping for your items please call 1-800-551-5953. During the holiday rush (December 11 - 24), please add one day to expected delivery ground transit times. In a hurry? 3 Day Air, 2nd Day Air and Next Day Air services available. Orders placed over the holidays (3:00 p.m. PST December 21 - January 1) will ship after January 2nd. To have your UPS driver leave your package when you aren't home, please request Shipper Release in the order notes during checkout. You will be able to track your package at www.ups.com with your tracking number provided in your automatic Shipment Notification. UPS 3 Day, 2nd Day and Next Day Air Delivery Guarantee - UPS guarantees air deliveries during holiday periods, weather permitting. Ground service is not guaranteed during holiday periods. Service Guarantee does not apply to UPS commercial, residential Ground or UPS Standard Canadian shipments picked up with scheduled delivery December 11 - December 24. On-schedule delivery guarantee for Air shipments within the US is extended 90 minutes on the day after Thanksgiving and December 19 - December 24. Sent via USPS - rates start at $9.95. Usually arrives in 3-9 business days after order ships. Canadian shipping charges via First Class Mail start at $9.95. 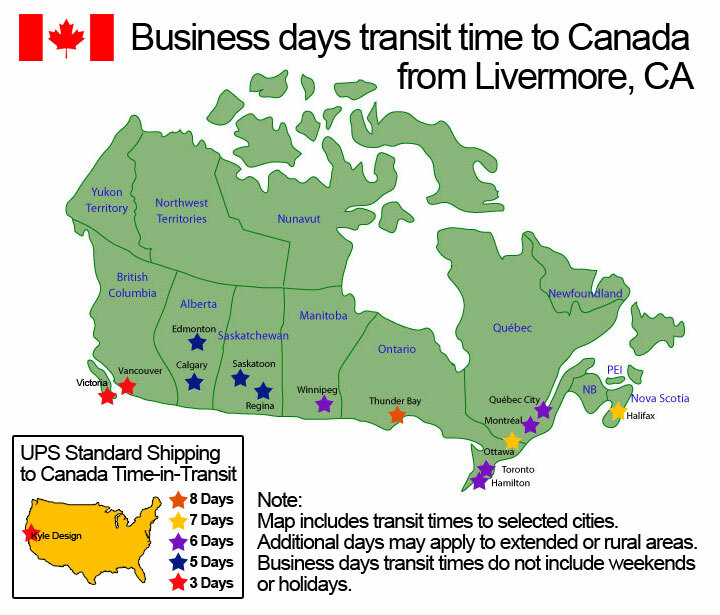 International shipping times vary, but delivery typically takes 1-2 weeks. You will be able to track your order from door to door. We recommend ordering early for holiday deliveries. Note that we cannot ship orders valued over $250 via First Class Mail to Canada. We will contact you about your changing your shipping method if your order qualifies. For quicker service, Canadian customers have the option of selecting UPS Ground Shipping to Canada if they want to track their order and avoid the standard mail customs delays. Shipping costs via UPS start at $27.95. Canadian Customs requires recipients to pay any applicable fees on shipments. Charges may include duties, GST, PST, HST, excise taxes, and other taxes on goods. 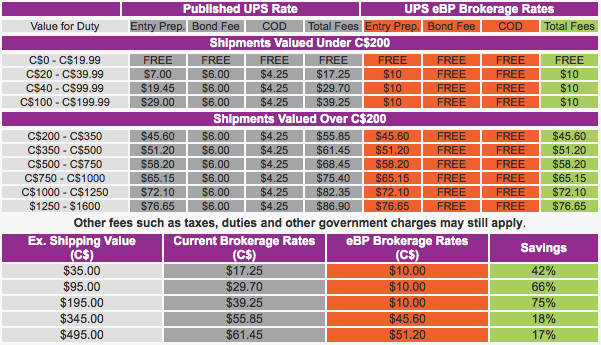 Brokerage fees are charged BY UPS for processing shipments and presenting the required paperwork to Canadian Customs. Canadian duty, customs, taxes, and UPS broker fees are separate from and not included in shipping fees. These fees are due upon receipt. Please contact your postal service or customs department. UPS broker fees are based upon the value of the order. Orders Under C$20 - UPS Standard Ground shipments with a total item value under $20.00 will not incur brokerage fees when entering Canada. Reduced Rates for Orders C$20 - C$200 - Eligible orders valued between C$20 and C$200 are assessed a reduced brokerage fee of C$10 (plus any applicable taxes and duties). This special rate is available under UPS's e-Tailer Brokerage Program (eBP) for shipments imported for non-commercial purposes that are shipped via UPS Standard Ground service. All other shipments may incur additional fees. These charges are due at the time of delivery, however you may call UPS at 1-800-742-5877 to arrange payment of these charges ahead of time. Please see the Canadian Brokerage Rate Guide for additional information. For larger chart on phone, copy image & zoom. The exact shipping address you enter is transferred to our delivery carriers. Orders with incorrect or incomplete addresses, and shipments that have been rerouted to a different address will be billed the UPS address correction fee which is $11.00 for ground, $12.00 for air. If you wish to change your delivery address and you shipped via UPS, you may sign up for UPS MyChoice and request the new address. If you have delivery location instructions and you shipped via UPS, please track your order. When it shows that it is out for delivery, contact UPS at 800-742-5877 and ask then to send a message to the driver with your instructions such as leaving it on a back porch, throwing it over a fence, etc. Weather Caused Delays - We are not responsible for weather caused delays affecting the arrival of your package and do not credit shipping costs under these circumstances. Air packages with weather delays are not given priority delivery from UPS. Once your order leaves our facility, we are not financially responsible for reimbursement of merchandise or shipping costs related to shipping delays or carrier errors as we have fulfilled our obligations. A shipment tracking number will be emailed to you after your order ships so that you can follow its progress and know when to expect it at your door.